Files with dkt extension are used by Drumstation audio composing program. They include drum kit data. The dkt file extension is associated with the Drumstation audio composing application for Microsoft Windows that allows music composers to create drum beats like on Roland drum synthesizers TR-909, TR-808 and TR-606. The .dkt file stores drum kit. The Drumstation is obsolete product. 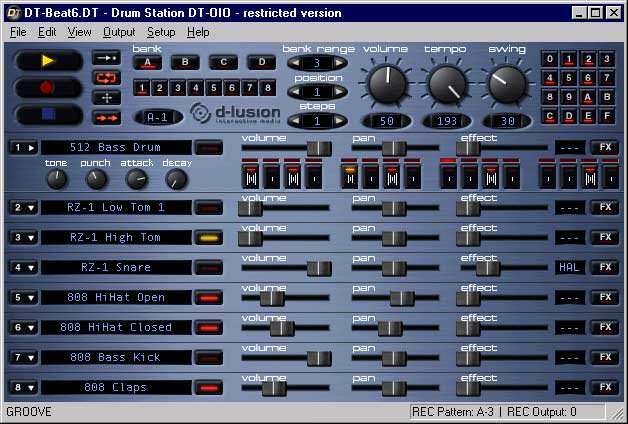 Drumstation is drum synthesizer for Microsoft Windows Based on the concept of the legendary Roland drum synthesizers TR-909, TR-808 and TR-606 whose throbbing bassdrums and crashing hihats sent generations of dance-music enthusiasts into extasy, Drumstation combines cool old drum machine features with cutting-edge software synthesis technology. It is not possible to open files with dkt extension. Files with dkt extension are not convertable. and possible program actions that can be done with the file: like open dkt file, edit dkt file, convert dkt file, view dkt file, play dkt file etc. (if exist software for corresponding action in File-Extensions.org's database). Click on the software link for more information about Drumstation. Drumstation uses dkt file type for its internal purposes and/or also by different way than common edit or open file actions (eg. to install/execute/support an application itself, to store application or user data, configure program etc. ).